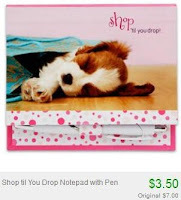 Adorable Notepads, Mugs & Piggy Banks from $3.50 + Free Shipping or 10% Off! NOTE: There is a HOT Plum District deal today that will allow you to score $30 in Totsy credit for only $13.50! (Use the promo cod fabulous or pdx10 when you check out) Click here for more info on that! Shaded Pink is featured on Totsy today selling lots of cute gift ideas! 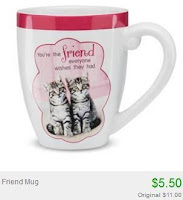 Starting at just $3.50, you can get mugs, notepads, plaques and piggy banks with adorable animals and quotes! All orders guarantee deliver before Christmas! There's a few different promos you can take advantage of right now as well. If this is your first Totsy purchase within 30 days of registering, you will receive free shipping automatically, but you may not be able to use a promo code.